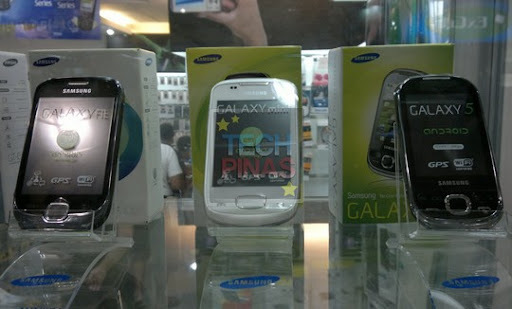 "[TechPinas, what are the cheapest Samsung Android phones in the market today?]" Good question, don't you think? More so, when we consider the fact that most Filipinos are actually very budget conscious consumers. So in true service of all Pinoy Samsung fans, we went to the mall last weekend and asked cellphone stores which Samsung Android phones are currently the most affordable. Samsung Galaxy Fit sells for Php 11,480 while Samsung Galaxy Mini costs Php 9,880. The most affordable Samsung Android phone available in the Philippines right now is Samsung Galaxy 5, which only sells for Php 8,980. Click on the links for full technical specifications and photos of each handset. There you go. I hope you find this helpful, TP Friends.